Oh dear. There’s something not quite right with this animal. This little guy is the lightest mammal known to science. It’s also a shrew, a species found in the Mediterranean and in parts of Asia, called an “Etruscan” shrew, that, like our video-shrew, is constantly moving — on average, 13 times every second. Think about doing anything (even blinking) 13 times in a second. That’s beyond frantic. To keep up its pace, its heart beats faster than a hummingbird’s (going as high as a record-breaking 1500 beats per minute). And so, shrews must burn a lot of fuel. Which means they have to constantly gulp air and gobble food. Every gram of this shrew’s body uses 67 times more oxygen than we humans do, and it eats nearly twice its body weight every day — just to stay alive. Twice its body weight! If this shrew goes without food for just four or five hours, it’ll starve. So by necessity the shrew spends its life furiously focused on hunting, snatching, biting. If you go to YouTube and type in “Shrew vs”, you’ll see them battling a crazy array of scary animals (scorpions! snakes!) And while we aren’t necessarily recommending a YouTube shrew-fighting binge, let’s just say that we wouldn’t bet against the shrew. Now — there’s something uneasy-making about these shrews (other than the alarming ease with which they can take down a garter snake). They’re such an extreme life form. Just to give you a sense of how crazy their appetites can be (and it’s not just shrews we’re talking about, it’s a bunch of teeny mammals), let’s do a quick exercise. Just below you will find two mammals, one big, one little. The top one is a vole (a small furry rodent about as big as a mouse), the bottom one an African elephant, the largest land animal in the world. Both voles and elephants love to eat grass. So in front of each, we’ve place a freshly cut pile of lunch. Your job? You are a portion-adjuster. You decide the amount of grass each animal needs to eat every day. Just follow your intuition and move the toggle switch to the right sized meal. Go ahead, give it a go. Not what you’d figured, right? We both thought the vole would need less — being so little. But no, the vole eats about 80 percent of its weight in food every day. 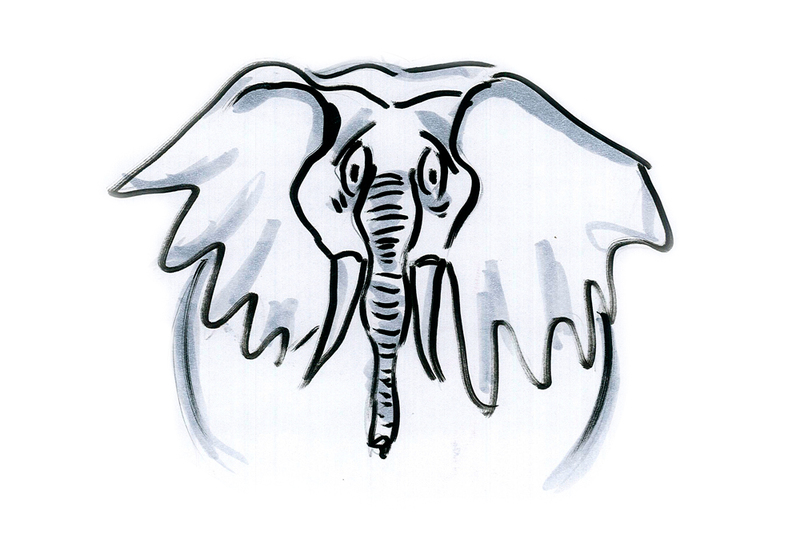 The elephant, just 5 percent of its weight. Which means, relative to size, the vole has a much bigger appetite than the elephant. Every ounce of a vole needs 16 times as much food as an ounce of an elephant. Why? Something odd is going on here. What if… (and we’re just wondering at this point..) what if big animals and little animals are built differently? Literally. From the bottom up. If you hold a tiny creature like a mouse in your hand (don’t try this with a shrew, because it’ll bite your finger), you can almost feel it whirring, brimming with energy. Clearly, lots of little animals (mice, chipmunks, squirrels) behave like this. On the other hand, the biggest mammals — elephants, whales, rhinos — seem to live at a quieter, slower pace. So there’s an obvious surface difference between big and little animals, but how deep does that difference go? Well, looking at an elephant and a vole, they don’t seem that different. Both are mammals. Both are made of cells. Both live on land, eat, poop, breathe oxygen, and move about. In a gross sort of way, you might think that elephants are just really, really, really giant voles, differently shaped of course, and with bigger bones to support their massive weight, but operating on similar principles nonetheless. But the “Lunch Puzzle” gives us pause. If a chunk of an elephant can survive on a sixteenth as much food as the same-sized chunk of a vole, something’s got to be different on the inside — deep down. But what? Big versus Little – Profoundly Different? Well, here’s another clue. Take a look at the graph below. It’s a collection of dots. In this case, each dot is a different animal. Going from left to right, it starts with the littlest animals (see our Etruscan shrew? It’s the very first dot at the extreme left because, as we know, it weighs less than a penny), and moving to the right you’ll see a mouse, a squirrel, a rabbit, a fox, a lion, a tiger, and so on. Way, way on the right is our pal the elephant. This graph is measuring appetite. Not for grass. But for oxygen. The graph is asking, which animals are running so furiously they consume the most oxygen per body weight? That is, if you took a small chunk of shrew, fox, lion and elephant, each chunk the same weight, which chunk (which animal) is consuming the most oxygen? Check it out! It’s just like our “Lunch Puzzle”. The pattern is the same. The littlest animal (the shrew) gobbles oxygen at a high, high rate (that’s why it’s high on the chart), just like the little vole gobbled grass. But as we move on to the bigger animals, their proportional need for oxygen goes down. You can see the dots dropping lower and lower as you move to the larger animals on the right. Just as every ounce of a vole needs 16 times as much food as an ounce of an elephant, a similar pattern holds true for the air they breathe. When compared ounce for ounce, a vole gulps down about 11 times more oxygen than the elephant. 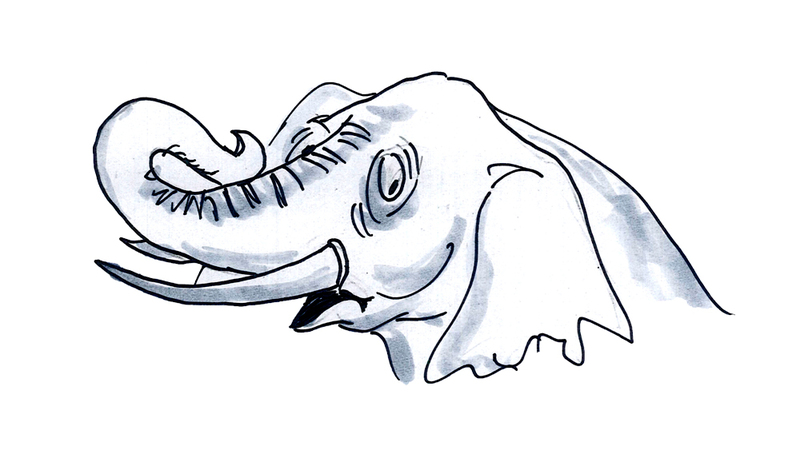 And so, an elephant isn’t at all like a giant vole. Per ounce of body weight, a bigger creature has a lower metabolism — its gulps less air, burns less fuel, and releases less heat — than a small creature. And it must be this way. To see why, we’re going to do a little ‘thought experiment’. This isn’t a real experiment, and in this particular case not a particularly nice one either, involving as it does, a self-combusting elephant. So, we’re going to take our big mammal and place it next to a teeny mammal, in this case, a mouse. As you can see, our elephant is MUCH bigger than the mouse. How much bigger? Well, the mouse weighs just under an ounce (about 20 grams); the elephant 11,000 pounds (5,000 kilograms). 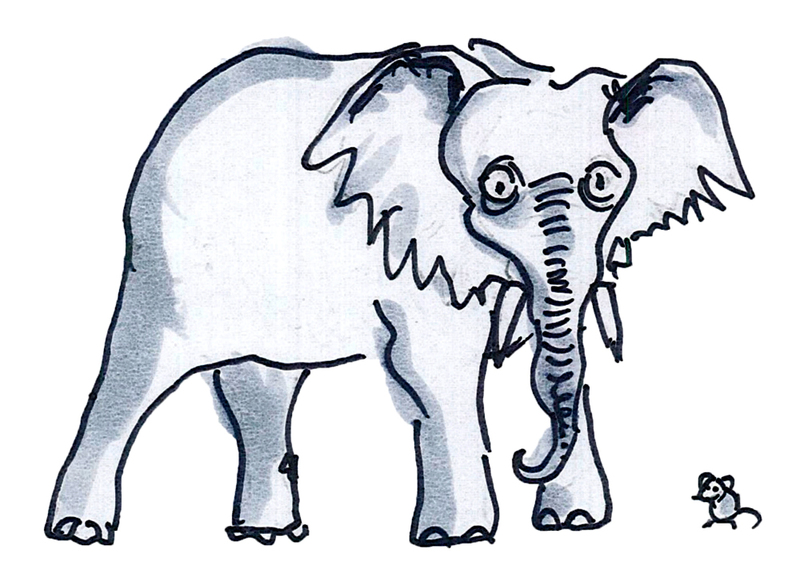 In other words, that elephant weighs 250,000 times more than the mouse does. OK, so that’s pretty big. But there’s a problem here. If you go back to our last post, we saw that as a creature grows in size, its insides grow faster than its outsides (i.e. its volume grows faster than its surface area). If a little mouse were to grow 250,000 times bigger to become an elephant, once it gets elephant-sized, it has trillions and trillions of nice, warm cells bunched together in its torso, its legs, so it’s pretty hot in there. And, because it’s grown bigger, it also has more surface area — more skin — to let the heat out. So it’s got a big problem. While the elephant has trillions more hot cells on its inside, it hasn’t got nearly enough surface area to let that heat out. It’s got 250,000 times more volume than the mouse, but only a piddling 5,000 times more surface area (more skin) on its outside, which leaves a crazy amount of heat – trapped, locked in – with no place to go. If an elephant burned fuel at the same rate as a mouse or a shrew, its insides should get so impossibly hot, that at some point, it should just….. But elephants never do that. Indeed, elephants use their large, thin ears to dissipate heat, in much the same way that a car’s radiator does — a large surface area is great at radiating heat. But unlike a car radiator, elephant’s ears don’t have nearly enough surface to get rid of the amount of heat we’re talking about here. In fact, if an elephant somehow had enough skin to release all of this the extra heat that we’re imagining, it would end up with great crinkly folds of skin, like a giant dimpled golf ball, or, says Princeton Professor John Bonner, like “a monstrous walnut”. So how come real elephants don’t go up in flames? We already know the answer — elephants don’t burn fuel at the same rate as mice do. That’s why they have such small appetites for their size. If you burrow down — all the way down — to a typical cell in an elephant, and then compare it to a typical cell in a mouse — amazingly, the two cells behave differently. A larger animal could not even exist unless its cells had a reduced rate of metabolism. It would either starve or burst into flames, or both. Shrews, we now know, are at the other extreme. A shrew is built from hungrier, warmer stuff. Shrew cells are like Mexican jumping beans in a cocktail shaker. Without its internal heaters turned up to-the-max, a shrew would leak out all of its heat and freeze. And this explains its furious appetite. Shrews are so insatiably hungry because, well, their cells are. If a shrew can’t find food, then, says John Bonner, it’ll suffer “irreversible internal damage after a few hours”. It’ll starve. 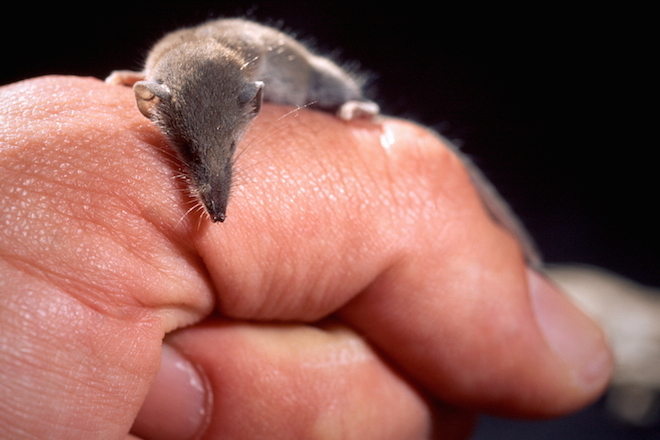 Psst… want to find out how a shrew powers its extreme lifestyle? How does it work at a cellular level? Click here to find out. Muscles come in two kinds, ‘slow-twitch’ and ‘fast-twitch’ (if you’re a meat-eater, you might know these as ‘dark meat’ and ‘white meat’). We all have a mix of both types of muscles. So for example, a marathon runner’s muscles have more of the energy-efficient ‘slow-twitch’ fibers that keep pumping out energy slowly and consistently. Meanwhile a sprinter’s or a weightlifter’s muscles have more of the gas-guzzling ‘fast-twitch’ fibers, that provide short bursts of furious energy. Think a Prius versus a Formula One car. An Etruscan shrew’s muscles are all of the fast-twitch variety — there isn’t a single slow-twitch fiber in its muscles — putting this extreme creature in a category beyond even the fastest human sprinters. Its cells are jam-packed with mitochondria, the microscopic battery-packs that power the cell. These cellular superpowers are the reason this shrew’s muscles can fire faster than any other known creature, breathing 15 times a second, moving 13 times a second, and shivering a blazing 60 times a second. And they’re also what makes the shrew such a hungry, hungry animal. And so, all the way down to the level of the cell, the metabolic rate of each creature — how much oxygen it gulps, energy it burns, heat it releases — is carefully tuned through evolution to meet the challenges of its size. Big creatures aren’t giant versions of little ones, instead they’re built from cooler and calmer parts. Their internal fires must burn at a lower rate. As far as we know, this wide-ranging rule holds true for most animals on the planet, not just mammals, but also birds, fish, crustaceans, snails, amphibians, reptiles, insects, and more. Thanks to this rule, our mammalian ancestors could grow from the twitchy, frenetic, shrew-like creatures that burrowed beneath the world of the dinosaurs into the lumbering giants that roam our world today. And thank goodness for this scaling difference. Think what would happen if the bigger animals on earth had the temperament, the appetite, the needs of a ferociously hungry shrew? That would be so horrible, so inconceivably terrifying that it would be — of course! a Hollywood movie! Uh-oh. The script doesn’t go there explicitly, but we know what poor Ann and Lorne are thinking as the shrews chew their way through the adobe walls of the lab, sniffing human food: “It’s dangerous to tinker with the gently scaling gifts of cellular biology,” or as Lorne prefers to put it, SHOOT! NOW! We’re indebted to John Bonner‘s lovely book Why Size Matters: From Bacteria to Blue Whales, for teaching us, among other things, that ‘why don’t elephants spontaneously combust?’ is actually an interesting question. His book is a fascinating tour of the science of size, and even includes some alarming facts that you probably don’t want to know. And a tip of the hat to David Haskell, whose wonderful book, The Forest Unseen, got us thinking about the restless life of a shrew. Every page of this book is an utter delight. 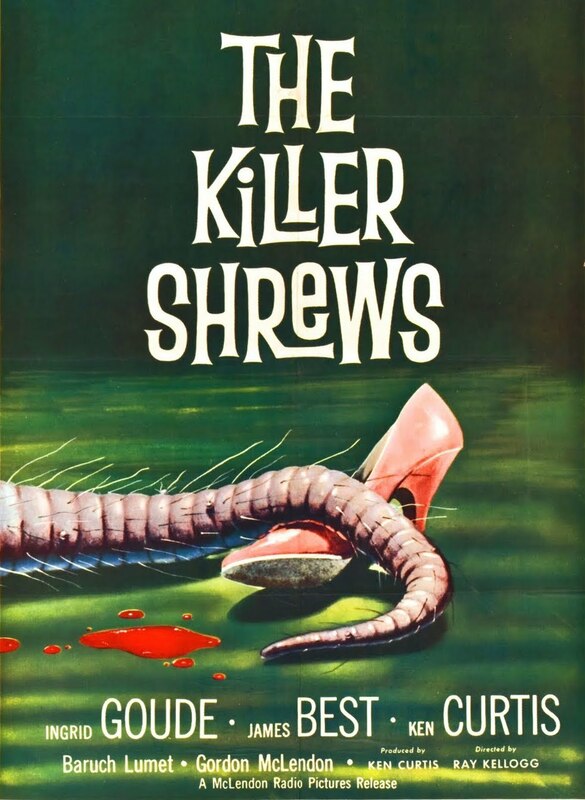 You can watch The Killer Shrew online, if you’re so inclined. It’s also been colorized, and even been mocked on Mystery Science Theater 3000. The data in the metabolism graph is from White & Seymour (2003), with a few additions, for elephants: Langman et al (1995), humans: Henry (2005), and voles: Kurta & Ferkin (1991). *While it’s true on average the cells of larger animals have a lower metabolic rate than smaller ones, a few particular types of cells don’t fit this rule, and you can read about those here (or here, if you really want to get into it). Noticing is a science blog by Aatish Bhatia and Robert Krulwich. 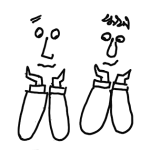 If you like what we're doing, you can find us on twitter @aatishb and @rkrulwich, follow the blog @noticingblog, or drop us a note. Great article! I loved your mix of science, whimsy, and silly graphics. And you didn’t even employ a “taming of the shrew” pun? Well done! This is really interesting, but what ultimately determines the rate of metabolism for an organism? Does a large organism have a slower metabolism than a smaller organism of the same species? It sounds as if the activity of the proteins that mediates these rates is chiefly affected by the temperature of their surroundings, which leads to these discrepancies and explains the high degree of correlation on that graph. That post was just beautiful, in every way. 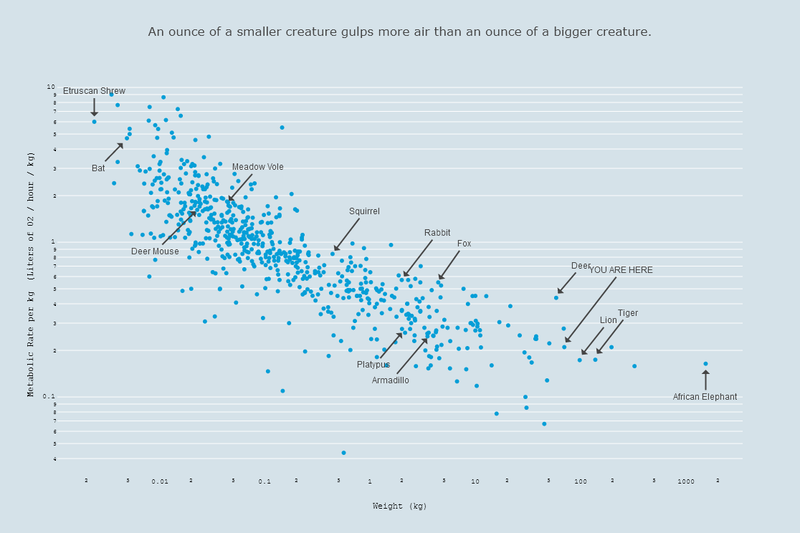 On the metabolic rate chart, the biggest outlier on the low end is the Indian fruit bat (I expected it to be a sloth). The biggest outlier on the high end it is… the Egyptian fruit bat! How is that possible? A fruit bat one fifth the size has >100x the metabolic rate. Good point, that looks suspicious. The dataset I used lists the metabolic rate for the Indian flying fox (Pteropus giganteus) to be very low, at 24.5 ml of O2 per hour ( http://www.pnas.org/content/suppl/2003/03/04/0436428100.DC1/6428Table1.html ). But when I google it, I get a much higher metabolic rate of 377 ml O2/hr ( http://eol.org/pages/327267/data ). My guess is it might be a data entry error in the former dataset, but I don’t know for sure. Bats are heterothermic, that is they switch between ectothermic (“cold-blooded”) and endothermic (“warm-blooded”) when at rest or while being active respectively. My guess is that the measurements used in your graph for various bats were sometimes taken while active and other times while resting… Almost all of the vertical outliers both high and low are bats on there. So how are these smaller animal’s cells different? Number of mitochondria? Why can’t we find small animals with efficient cells? You’d think they would evolve such for better survival. Sorry, I can’t let this go… “is carefully tuned through evolution to meet the challenges of its size”. How can you just make that statement? In the statement itself, “carefully tuned”. How can something random, carefully tune itself? My ukulele has never tuned itself since I’ve owned it. The tuning is not random, any more than breeder selection is random. The species is ‘tuned’ as a result of individuals meeting the survival challenges of their environment with differing levels of success. I would take issue with the word ‘careful’ however. There’s nothing careful about it or kind. Countless species have fallen by the wayside; some were probably spectacularly adapted to an environment, but were in the wrong place at the wrong time. Great article. Love the site. >This embedded plot has reached the maximum allowable views given the owner’s current subscription. >Please visit the subscriptions page to learn more about upgrading. It was fine a few days ago. It was a static graph, right? Someone should take a screenshot of it and update the article. No need to render the graph for every visitor. So we have blue whales because… the sea is a good heatsink?